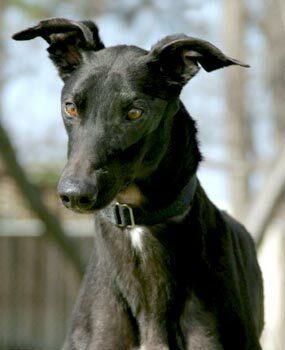 Jack, aka KMJ Jackem, is a handsome, 2-year-old black male born April 19, 2007. His sire is Kiowa Sweet Trey and his dam is RMJ Fly On By. 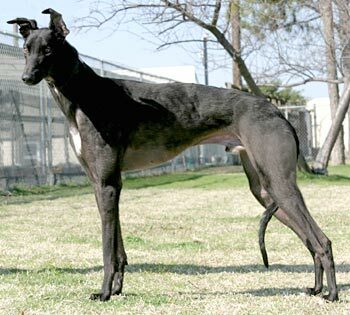 Jack has no races to his credit, as he made it plain at the 2008-2009 season of Valley Race Park in Harlingen, TX, that he was absolutely not a contender for the track – but a couch...that is a different story! His ears are most dramatic and flexible! Jack’s introduction to cats: Jack passed his cat test quite nicely. After getting swatted away a few times by Domino, he didn’t want to mess with any of the cats.